Got extra nectarines on hand? Look no further—stone fruit is absolutely delicious in salads! 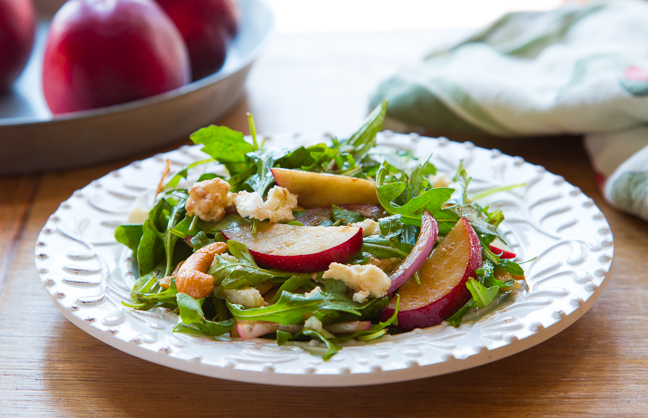 This arugula nectarine salad with cashews and mozzarella is our new summertime go-to salad. 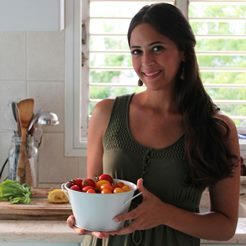 A refreshing salad to use up those last nectarines or peaches of the summer! Step 1: Core and slice the nectarine into ½ inch wedges. Thinly slice the scallions and tear the mozzarella into ½ inch chunks. Step 2: Toss the arugula with the sliced nectarines, onion, torn mozzarella pieces, and cashews. Step 3: In a small bowl, whisk together the olive oil, balsamic vinegar, and mustard. Toss the salad with the vinaigrette. Season to taste with freshly ground black pepper and sea salt. Serve immediately after dressing the salad.